Everyone’s favorite Beantown psychic detective is back on the case in Cognition – an Erica Reed Thriller – Episode 3: the Oracle, the third installment in the ongoing Cognition adventure series. In case you missed episodes 1 and 2, Erica Reed, the protagonist of Cognition, is an FBI agent who tracks down serial killers. In addition to the normal forensic capabilities that law enforcement uses, Erica also has Cognition abilities – i.e. psychic powers that she can use to reconstruct past events. If you haven’t played the first two episodes, then you should start this series there. You might get by without playing episodes 1 and 2, but they provide critical story and character development that episode 3 continues without hesitation; that, and they are worth playing because they are pretty good. If you enjoyed the first two episodes, then episode 3 is easy to recommend, as you will want to see how the story develops. At the end of episode 3, you will, most likely, be hungry for the next installment. Like episode 2, The Oracle picks up mere hours after the end of the last episode. After having lost her boss and then rescuing her colleague, Sullivan, Erica is now drawn into the investigation of another murder. Other than that basic setup though, episode 3 deviates immediately from the formula established in the first two episodes. In episodes 1 and 2, the FBI field office functioned as your home base, and the episode had somewhat of a self-contained murder mystery. You would visit various locations in Boston, collect evidence, and interrogate suspects. In episode 3, on the other hand, the Boston city map and the FBI home base are gone. The entire episode takes place, instead, in one skyscraper. Your murder investigation is limited to the prologue, and the guilty party is revealed right before the opening credits. Soon thereafter, the game introduces a new playable character, and you spend the rest of the time switching back and forth between Erica and that other character. Episode 3 is, ultimately, Cognition’s version of Harry Potter and The Half Blood Prince. There is minimal story progression in the present, but there is a lot of time spent looking in the past, learning the origin of the Cain Killer and the other characters of the series. Because The Oracle is largely expository, it flows a lot like the typical middle chapter of a series. Its story meanders somewhat, occasionally bogging down in character interactions that are somewhat dry (albeit necessary to tell Cognition’s story). The lack of new locations or travel is also kind of a bummer. The sense of adventure, exploration, and discovery that thrived in the first two episodes isn’t in this one. About 2/3 of the episode is spent in four different rooms, playing as the two characters. As a result, the middle portion of the episode is kind of a drag. The good news, however, is that the ending easily makes up for it, with some interesting reveals and another climactic puzzle solving scene. On the whole, the story continues to be a valuable asset for the series. One area that has little downside is the visuals. The technology isn't cutting edge, but the art department at Phoenix Online Studios continues to produce some wonderful cel-shaded scenery and some great cut scenes. Part of the reward for completing a puzzle is just to see what the next area looks like. There are some terrific looking paintings in the apartment where you spend most of your time, and they actually factor into one of the game’s major puzzles. The series also continues to get a lot of mileage out of the occasional gruesome image of violence, torture, or death. Cognition, despite the fact that it is just a game, makes its crimes seems like real tragedies. The visuals, along with the writing, deserve a lot of credit for this success. The voice acting, on the other hand, continues to be inconsistent. Some of the performances are pretty good, adding some necessary depth to the characters. Erica Reed still raises her voice a lot and talks tough like she is in an 80s cop drama, but her corniness has kind of grown on me. On the other hand, John McCoy, Erica’s partner, has an important scene, and the voice performance for his character almost ruins it. It is a tense scene where Erica confronts John for something that he has done wrong, and he responds with about as much emotion and anguish as somebody who forgot to set his DVR to record his favorite TV show. It is an important scene that doesn’t deliver the emotional weight that it should. The traditional point-and-click gameplay returns, with significantly more emphasis put on the supernatural abilities of Erica and the other playable character. The two characters work in tandem and solve puzzles by finding different pieces of the puzzles at different points in time. The puzzles are harder this time, and they require you to notice material that looks optional or unimportant on the surface, but actually has critical clues. They aren’t worse or more illogical than other point-and-click puzzles, but I can easily see somebody getting stuck badly in this game if they haven’t read through their cell phone messages or journal with keen enough eyes. One safecracking puzzle, in particular, requires you to use some very minor-looking details. Beyond that observation, there isn't a lot to say about the puzzles, other than that they are mostly par for the genre, for better or for worse. If that fact hasn't bothered you up until now, it won't bother you in this episode either. 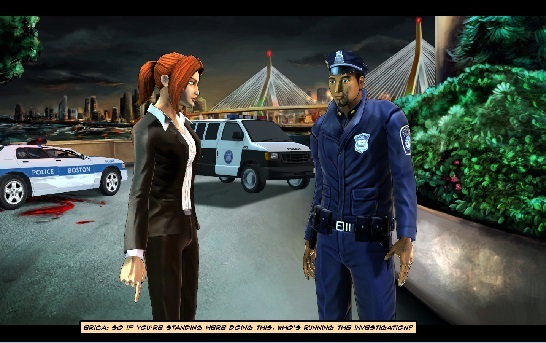 Cognition – An Erica Reed Thriller – Episode 3: The Oracle, is mostly an entertaining experience. You may miss some of the features that showed up in the first two episodes, like the forensics/murder investigation elements and the variety of locations. I found myself missing those, which is why I enjoyed Episode 2: The Wise Monkey a little bit more than episode 3. Episode 3 does have its strengths though. The new playable character is a surprising change that keeps the formula fresh, and the characters in the game are people whose history you will want to learn. The story is turning out to be less predictable than I expected too – events take place in The Oracle that I didn’t expect to happen until the very end, which means that I have positively no idea what to expect in episode 4. In the meantime, if you played the first two episodes and you liked them, you should pick up episode 3. You might feel some monotony while playing it, but the strong points of the episode and the payoff at the end make up for it. Overall, this series is worth starting if you have yet to jump in. Cognition: an Erica Reed Thriller – Episode 2: The Wise Monkey is a solid step forward for this promising mystery series, even though the technical issues on the iPad are a bit of a drag. The point-and-click gameplay does feel somewhat outdated, but it is devoid of the pixel hunts and illogical hilarity that has ruined past games of the genre. The unpredictable story is very good, and the writing is solid, albeit not perfect. This episode is a quality experience, and since Episode 3 is also out on the PC, the story is worth investing yourself in. Despite its problems, Cognition succeeds at immersing you in its emotionally charged, supernatural mystery. If you are fond of mysteries and adventures, you won’t regret the time that you spend with the first episode of this promising series. While it shares lots of flaws with its brethren of the genre, this point-and-click adventure game has enough going for it with its story and cognition mechanics to make it worth playing. The point-and-click gameplay does feel somewhat outdated, but it is devoid of the pixel hunts and illogical hilarity that has ruined past games of the genre. The story is good, and the writing is solid, albeit not perfect. This episode is a quality experience, and if they continue to improve, this series may end up being a very special one.